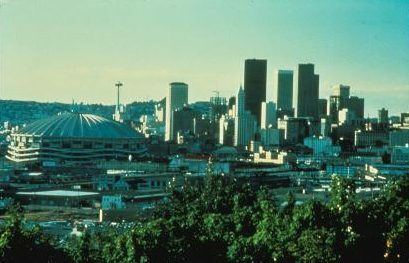 Downtown Seattle featuring the Kingdome, as seen from Beacon Hill in 1981. Originally called the King County Multipurpose Domed Stadium, the Kingdome dominated the south end of the Seattle skyline for 24 years. Upstaged only by the Space Needle as a tourist attraction, the unassuming dome was a revolutionary structure for its time. Yet unlike the space age tower’s privately funded beginnings, the concrete arena’s origins have a controversial history that began in 1959. In that year, restauranteur David L. Cohn of Metropolitan Grill fame, proposed a covered stadium to the City Council in order to attract major league sports teams. Convinced of the profitability of the endeavor, the council placed a $15 million bond measure on the ballot in 1960. It failed, as the public were skeptical such a structure could be built at that cost. A second attempt at a bond measure in 1966 met the same fate. Finally in February 1968, King County voters approved $40milion in bonds for the domed stadium, with the building site yet undetermined. Feasibility and economic impact studies in 1966 determined the best location for such a stadium was Seattle Center on the prior World’s Fair grounds. The public refused again at the ballot box in 1970, forced the City Council to consider alternate sites. Although it placed last in the aforementioned feasibility study, the plot of flat land adjacent to King Street Station and the International District was eventually chosen for the stadium. Seattle’s distaste for the project reached fever pitch at the Groundbreaking Ceremony on November 2nd 1972. Chants “Stop the Stadium” escalated as activists threw mud balls at visiting dignitaries and government officials, and successfully ending the proceedings early. Built primarily as a sporting venue, The Dome continued its record breaking streak. The first hosted sporting event, an exhibition soccer game between the Seattle Sounders and New York Cosmos held on April 9th 1976 with 58,120 in attendance, was the largest crowd at a soccer match in North American history at the time. World soccer icon Pele scored the first goal that night. Equally as notable, a few weeks later, Paul McCartney’s Wings Over the World tour played the first concert at the Kingdome. Footage from the event became the epic concert film “Rockshow” and marked the first time The Beatles frontman had performed in North America in a decade. Many prominent sporting and cultural events followed including the NFL Pro Bowl in 1977, the Major League Baseball All-Star Game in 1979, and the 1987 NBA All-Star Game, making the Kingdome the only venue to host all star games for three major sports leagues. Concerts included three tours of the Rolling Stones, Pink Floyd, U2, Madonna, Led Zeppelin, Aerosmith & Metalica. Children of the 80’s doubtlessly remember advertisements shouting “Sunday, Sunday Sunday at the Kingdome!” for the frequent Monster Truck Rallies that came through town. The highest attendance at any event in Kingdome history was a maximum capacity audience of 74,000 for a concert featuring singer Johnny Cash. That night 5,000 would be attendees were turned away. In the 1990s seismic concerns and chronic problems with falling ceiling tiles doomed the structure, and its demolition was planned for early in the new millennium. The failed bond measures of the 1960s and 70s plagued the Kingdome all the way beyond its untimely end with the Seattle City Council finally paying off the last payment in 2015, more than a decade after Century Link Field had replaced the footprint of the world’s largest domed building. Did we miss anything? Let us know about your favorite Kingdome memories, victories or gripes in the comments below.